Because sometimes even 30 minutes is too much for me, I used to go to Dinner MyWay to get freezer meals, but they aren't cheap, so I decided I needed to start making them myself. If you're not familiar with freezer meals, check out my new favorite freezer meals cookbook - Fix, Freeze, Feast: Prepare in Bulk and Enjoy by the Serving. My favorite thing about this cookbook is that it is written based upon the bulk sizes at warehouse stores. Each recipe is for "one tray of chicken" or "one tray of pork chops." I buy one tray and make two recipes by splitting them in half. Basically, the idea is to do all the prep beforehand, then do the cooking when you are ready to eat the entree. This is different from other freezer meal cookbooks, which often have you cook everything ahead of time. I can't deal with the changes that happen to the texture of the foods, so I prefer the Fix, Freeze, Feast method. It also avoids all those canned soups and processed stuff that is in other freezer meal cookbooks. I've tried two of the recipes and they were great. I've got two more in the freezer to try out! Katie of Notes from the Kitchen Sink made Roasted Salmon with Lemon-Herb Matzo Crust. Tami of Vegan Appetite turned Rachael's recipe for Chicken with Roasted Red Pepper, Chorizo and Sweet Pea Sauce over Rice into a vegan dish. Sook of My Fabulous Recipes adapted Rachael's recipe for Mexican Lasagna. Somethingcakey's Blog features a recipe I might have to try: Mocha Ice Cream Cupcakes. Kathy of Kathy's Kitchen made Fajita Chilaquiles Casserole. Jessica of Weeknight Gourmet made Burgers all’Amatriciana. 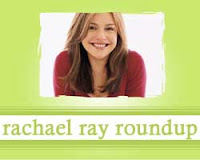 Sweet and Saucy recommends an easy recipe for Funnel Cake from Every Day with Rachael Ray. Cate at Sweetnicks made Tequila Lime Marinated Chicken. Deborah of Taste and Tell made one of my favorites: Sloppy Buffalo Joes & Mashed Potato Skins. Paula of The Cookbook Junkie made Bourbon Orange Skillet BBQ Chicken with Cornbread Topper. Rachael Ray drew a tulip to help out a great cause. Megan of My Baking Adventures made a comfort food favorite - Cheesy Risi e Bisi. SF Foodie offers a review of Rachael's pick in SF for Rachael's Vacation.